The Ranger LS43B laser wheel balancer optimizes wheel weight placements with exclusive Laser-Spot™ technology. Laser lines clearly indicate outboard and inboard weight placements for incredible balances within hundredths of an ounce. Wheels that are laser-balanced drive like new! 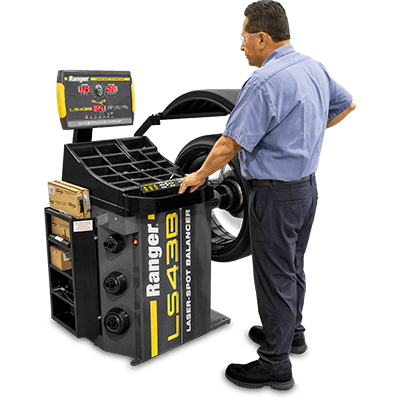 The Ranger LS43B laser wheel balancer handles wheels up to 43 inches in diameter. The average cycle time is just 7 seconds, making it one of the fastest floor-to-floor balancing machines ever built. Ranger's revolutionary 3D Auto Data Entry system combines our exclusive DataWand™ and Quick-Touch Data Arm™, allowing you to automatically enter all wheel parameter settings in seconds flat. That gets you wheel diameter, wheel width, offset distance and targeted weight placement selections for exact balancing every time. Simply extend the built-in measuring wands and tap the wheel. That’s all it takes to achieve your desired wheel profile and wheel weight settings without having to manually input the data. Still, if you’re "old fashioned" and still like to enter data manually, go right ahead. It’s as easy to use the manual soft-touch control panel as it is to use the 3D Auto Data Entry system. Laser balancers are increasingly being used in high-volume shops because lasers eliminate second-guessing and speed up weight placements. This also means the balance check you perform after placing inboard and outboard weights will almost always be clean. The fewer weights you use, the better your bottom line. Plus, customers will enjoy long-lasting balances that make their rides feel like new again. When ALU modes are selected and stick-on weights are desired, instinctive lasers mark the low-side of the wheel at the 6-o’-clock position, making stick-on weight placement and installation a breeze. When it’s time for clip-on weights, the intuitive data control automatically senses that topside weight positioning is desired and pinpoints the laser at precisely 12-o’-clock. Laser-Spot™ weight-positioning lasers provide greater weight placement accuracy and help reduce mistakes. More single-spin balances and fewer customer comebacks will increase productivity and profits. It’s that easy. This balancer features Ranger's exclusive 3D Auto Data Entry ​technology, so you never have to manually input wheel parameters again. It takes most techs an average of three seconds to retrieve the wheel diameter, wheel width and offset distance from this balancer. Our extendable DataWand™ automatically retrieves all outer-wheel information, while the inner data set arm detects the offset distance between the machine and your tire-and-wheel configuration. Ranger's highly accurate Digital Sensor Technology features a 16-digit digital signal processor and single-chip technology that increases productivity and offers unprecedented speed and accuracy, especially during the sophisticated balance and weight placement techniques required for newer high-tech OEM and aftermarket wheels. As soon as you lower the spacious wheel hood, the LS43B laser balancer spins into action, delivering precise outboard and inboard weight placements in mere seconds. Static, dynamic and ALU weight placement options can be pre-selected or retrieved simultaneously after a single spin, so you're always able to choose the option that best suits your particular wheel profile. After a quick spin of the wheel, a dual-plane automatic electromagnetic braking system automatically slows, stops and holds the wheel in the correct position, eliminating the need for a foot-activated brake with wheel-holding pedals. This gives technicians the freedom to move without restraint when placing weights on both the inner and outer faces of the wheel. At the precise instant the brake is engaged, dual Laser-Spot™ lasers come to life and pinpoint exactly where either the stick-on or clip-on wheel weights should be fastened. A bright, wide LED beam is activated at the precise moment the balancer brake engages. The LED assist light, dual lasers and auto brake will all remain active until the stop button is manually pressed. Dual-component piezoelectric quartz load sensors and digital rotation encoder measure longitudinal, transversal and shear effects for multi-directional force unbalance detection. The piezoelectric force sensors are the most sensiotive sensors we have ever made, offering superior stability and fatigue resistance for unlimited service life with your wheel balancer. The high-rigidity quartz crystal sensors offer high frequency detection in all three measured directions. A self-centering, non-marring Quick-Nut and bell adapter set ensures proper centering of the wheel and eliminates counterproductive setup errors. You'll mount wheels faster and easier, minimizing the risk of customer come-backs or costly wheel damage. Included with every machine are both standard and heavy-duty mounting cones, as well as a full accessory tooling package. The LS43B laser balancer's tooling package includes our standard car and light truck cones, as well as a heavy-duty truck cone and spacer ring. This well-equipped package includes three automotive and light truck cones: 1.75” - 2.75”, 2.75” - 3.50” and 3.50” - 4.25”, as well as one truck cone 4.50” - 5.00”. An open-top side shelf accommodates a large roll of Ranger Quick-Peel™ adhesive tape weights. Included with your purchase is a complimentary wheel weight starter kit that fits directly into a built-in tape weight feeder. Additional weights are available for purchase at any time. The LS43B laser wheel balancer features a computer interface with weight optimization technology that automatically calculates the minimum amount of weight needed to achieve optimal balance. Minimizing weight usage at your place of business is sure to add up to real savings over time and ultimately increase your bottom line. An anti-reflective, touch-pad display panel features tire and wheel assembly graphics that help simplify the speedy entry of wheel data. The display panel efficiently guides techs through each balancing procedure. Operator function keys are labeled with simple, easy-to-read icons to help operators identify and command all balancing functions. Bright LED weight placement indicators show weight positions as the wheel is gently rolled to exact top-dead-center. Tiered weight placement indicators help identify out-of-sight weight placements, such as split-weight or hidden “behind-the-spoke” techniques. Indicators assist operators with clip-on and tape weight placement at precise locations for zero-on balancing. A free kit of wheel weights is included with every new LS43B laser wheel balancer. Each unit’s starter kit contains one bulk roll of 100 silver adhesive steel tape weights, one bulk roll of 100 black adhesive steel tape weights and one starter box of mixed clip-on steel weights. It’s our way of getting you off on the right foot. Additional Ranger wheel weights are available for purchase at any time.